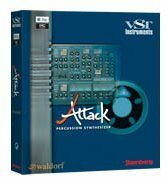 Attack, Virtual Percussion Synth from Waldorf. I have had no compatibility issues so far running this on my Macbook. I have not needed to reference the manual as this is a fairly simple plugin. Yes, the general configuration is simple and setting it up is very simple too. Its really a matter of selecting individual sounds or grabbing a whole kit, do some tweaking with the parameters to the right and thats it. The typical functions are fairly easy to access in regards to the fact that they are all right in front of you. Some of the buttons and text are very small though and hard to read. 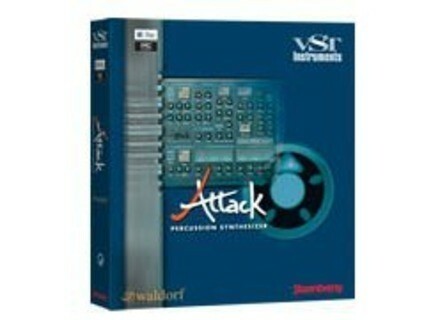 I run this synth on Logic 9 and Ableton 8 and so far it seems to work great. As I mentioned with the Waldorf PPG synth, for some reason the laptop keyboard doesn't respond well with this plugin in Ableton 8. It works great with a real midi board but the laptop keyboard is sluggish and basically decides when it wants to play the note you hit. The software is very stable, no crashes or lost presets. As for performance with a midi controller, it works perfectly well. I have been using this for two months. What I like most about this synth is the sounds. It has about 9 kits that are all pretty good sounding. They are designed to sound like old drum machines so actual acoustic drum realism is not what we are going for here. I really enjoy the 808 and the 9000 kits, very fun to play with and generally make me want to write some old late 80's hip hop, haha. I guess the only thing that irritates me about this synth is it can be hard to read in a live setting. I wish everyone followed the format of Logic 9 where you can expand the size of you plugins and everything inside the GUI gets bigger too. I paid $100 for this and two other plugins. I like this one the most out of the three so I am ok with paying the price for mainly this guy. I give it a 10 out of 10 for sound quality. Pretty believable to me. Yes, I have used a lot of other drum synths like Impulse, battery, Ultrabeat, tattoo, etc... and this one is a very small stripped down synth in comparison. Yes, I would buy this one again, its nice to have a drum synth that is just designated for these old sounds.